round number of grandkids 10!!! Hard to believe. This year started out every busy with 5 workshops. But now I am back on track and I finally sent the Bountiful Basket pattern to the printer. It just arrived today. Finished size 61" x 75"
The Baltimore Spring fabric line was released earlier this year and we have had so many request me to make fabric kits for the FREE "Spring Fling" pattern I did the combines the Baltimore Spring fabric panel and coordinating fabric. 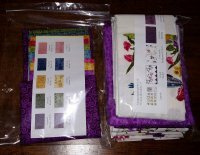 We currently have 2 quilt kits with the small vine background fabric available. The vine print is currently out of print and we will substitute the Overall rose background on any new kits. 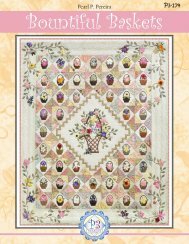 If you missed getting the Free pattern you can got to the Free category on the web site and download the PDF. Limited to the stock on hand. I Hope you have a wonderful day. keep Stitching.